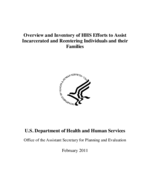 The purpose of this document is to help Department of Health and Human Services (HHS) agencies know the full range of programs and services in the Department that currently address the needs of incarcerated individuals and their families and to understand what research and evaluation efforts are underway to identify evidence-based practices. Although HHS programs are not specifically targeted to incarcerated and reentering individuals and their families, many HHS programs do serve these individuals and families as part of the broader population served. Additionally, there are HHS research, demonstration, and evaluation efforts focused on this population because incarceration is an important risk factor for adult and child well-being, as well as the well-being of families and communities. The inventory that follows will facilitate stronger intra-agency collaborations to address the many needs of these individuals and families and to improve their well being. It will also serve as an information source for other Departments and our public and private sector partners. Increasing the safety, security and well-being of individuals, families and communities requires the resources of many partners. These partnerships will be stronger when all the partners know what resources are available and what activities are already in place. Over 7.3 million people are on probation, in jail, in prison, or on parole in the United States ( PEW Center on the States, 2009). Incarceration and reentry adversely impact a number of areas in which the Department of Health and Human Services is heavily invested, such as family formation, parent-child relationships, economic self-sufficiency, and overall health. Incarceration not only affects incarcerated individuals, but also their families and the communities where they lived and to which they will return. The mission of HHS is to protect the health of all Americans and to provide essential human services, especially for those least able to help themselves. The overall mission of HHS gives the Department a substantial stake in ensuring that the health and human services needs of prisoners are met, inside prison and when they return to the community. The next section provides an overview of the relevant research on the key human services and health needs of incarcerated and reentering individuals and their families along with illustrative examples from the inventory of current HHS activities addressing these issues. The inventory portion of this document contains information on HHS activities that serve incarcerated and reentering individuals and their families. The activities include programs, demonstration projects, research, and evaluations that were funded and/or operational in FY 2009 and/or FY2010. Inventory entries begin on page 1 and are in alphabetical order by agency and sub-division.